For project reason I have to measure the performance of OData service being accessed parallelly. And I plan to use the open source tool JMeter to generate a huge number of request in parallel and measure the average response time. Since I am a beginner for JMeter, I write down what I have learned into this blog. I will continue to explorer the advanced feature of JMeter in my daily work. 1. Download JMeter from its official website. 2. Create a new test plan for example Customer_Query_OData_test, and right click on it and create a thread group from context menu. Switch to Advanced tab, choose “HttpClient4” from drop down list for Implementation, and maintain proxy server name and port number. 3. Create a new HTTP Header Manager and specify the basic authentication header field and value. 4. Create a listener for the test plan. In my test I simply choose the most simple one: View Results in Table. And I have written a simple Java application to generate parallel request via multiple thread and the result measured in Java program is consistent with the one got from JMeter. The source code could be found from my github. 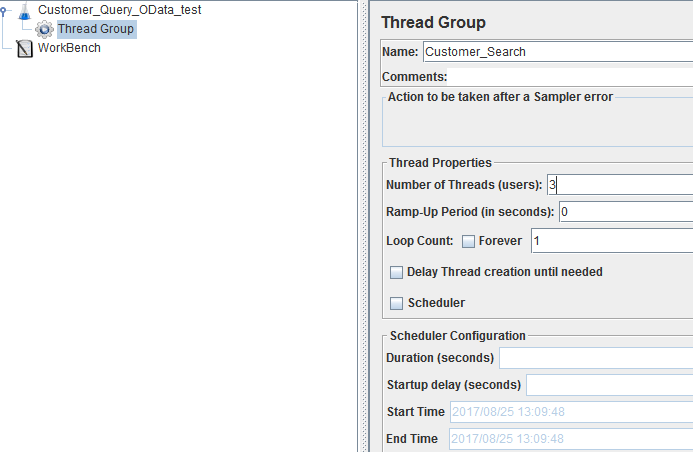 So that in the end each thread will issue different query to OData service end point. Wouldn’t a more valid performance measurement use different data request on each parallel request? Thanks a lot for reading. Yes you are right, I will soon research how to issue different query in each thread via JMeter. I will update the blog once I found solution. Meanwhile it is very easy to achieve the same via Java code. I have updated the blog to add the part how to generate random query for each thread in JMeter.